Sunday, June 14 ~ 7:00 p.m.
Tickets $25/$20 for Siskiyou Music Project Members, $10 for students. Siskiyou Music Project welcomes back Occidental Gypsy from Rhode Island. 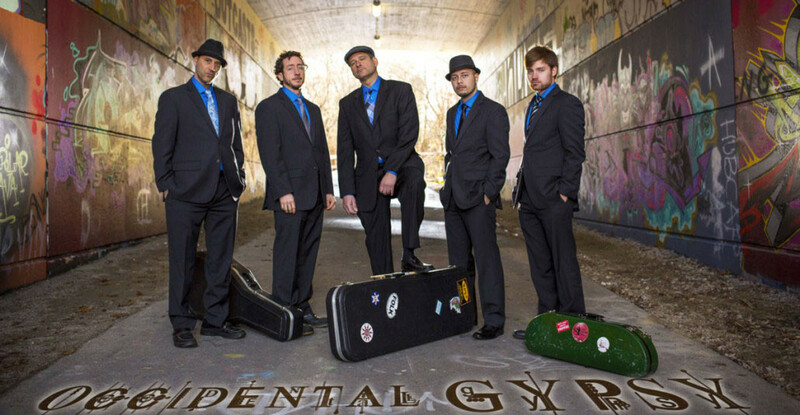 Occidental Gypsy is pioneering the sound of World Gypsy music. Their mélange of uptempo, high-energy rhythms of gypsy swing, melded with the catchy melodic hooks of pop and complex structures of jazz delivers a thrilling auditory experience to listeners. Occidental Gypsy was originally formed by brothers Brett (lead guitar) and Jeff Feldman(bassist) as a straight-ahead Gypsy Jazz Quartet. Through the release of Over Here and the addition of new members, the band has taken on a far more diverse, sophisticated, and eclectic sound. The group is fronted by Berklee-trained Jonathan Hurley, and takes the audience to soaring heights by young prodigy violinist Eli Bishop and percussionist Erick Cifuentes. The band also occasionally taps international talents to join the band on stage like Yuki Nakajima and Jason Anick of the John Jorgenson Quintet. Live, the band compliments original material with expertly arranged ‘gypsified’ covers. Occidental Gypsy’s unique approach to world, pop, jazz and dance music stems from the influence of Gypsy Swing founders, Django Reinhardt and Stephane Grapelli.The members of the group posses a deep knowledge and reverence for the Gypsy style and feel honored to bring their music to the ears of new audiences. And now, with an ever-growing list of performances, and presence online through website and social networking pages, Occidental Gypsy’s fan base is constantly expanding. Featured violinist Eli Bishop began his musical studies with the violin at the age of three. Over the years he continued his musical education at the Vanderbilt Blair School of Music in Nashville and the Berklee College of Music in Boston. His studies of various musical styles–including Classical, Western Swing, Rock, Country, and Jazz– provided him with the opportunity to perform with a wide variety of musical artists ranging from Vince Gill and the Time Jumpers, to the Wooten brothers, Bill Evans of the Miles Davis Groupand Wynton Marsalis. Within the band, Eli showcases his eclectic and masterful technique that has brought him ’round the world with the greats. The name Occidental Gypsy (Western gypsy) embodies the concept behind Gypsy World fusion. The group has taken the Gypsy sound that originated in Eastern Europe and brought it Over Here to blend it seamlessly with contemporary American music. Interestingly, Gypsy Swing was created by taking American Jazz to the East and blending it with the Gypsy Folk tradition. Now almost a century later Occidental Gypsy brings the music back home.